Light now a 7-day candle for your friends! 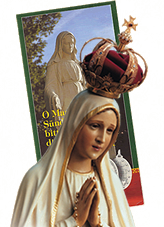 Do you have friends, acquaintances or relatives for whom you would like to ask Our Lady for graces? You can light a seven-day candle for a friend. Light now a seven-day candle for your friends, acquaintances or relatives! I DON’T want the prayer intentions to be sent to friends, acquaintances or relatives. Light a candle for your friend!